On November 8, 2018, a major wildfire, the "Camp Fire", destroyed most of the town of Paradise, the adjacent community of Concow, and many square miles of rural, hilly country east of Chico. More than eighty people were killed, fifty thousand were displaced, 200,000 acres were burned, and twenty thousand buildings were destroyed. The Camp Fire is California's most destructive and deadliest fire. 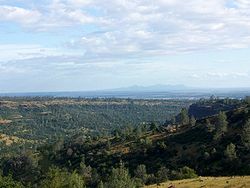 The 2010 United States Census reported that Butte County had a population of 220,000. The racial makeup of Butte County was 180,096 (81.9%) White, 3,415 (1.6%) African American, 4,395 (2.0%) Native American, 9,057 (4.1%) Asian, 452 (0.2%) Pacific Islander, 12,141 (5.5%) from other races, and 10,444 (4.7%) from two or more races. Hispanic or Latino of any race were 31,116 persons (14.1%). As of the census of 2000, there were 203,171 people, 79,566 households, and 49,410 families residing in the county. The population density was 124 people per square mile (48/km²). There were 85,523 housing units at an average density of 52 per square mile (20/km²). The racial makeup of the county was 84.5% White, 1.4% Black or African American, 1.9% Native American, 3.3% Asian, 0.2% Pacific Islander, 4.8% from other races, and 3.9% from two or more races. 10.5% of the population were Hispanic or Latino of any race. 14.2% were of German, 11.1% English, 10.2% Irish, 7.8% American and 5.6% Italian ancestry according to Census 2000. 87.9% spoke English, 7.8% Spanish and 1.4% Hmong as their first language. The citizens of the county of Butte are represented by the five member Butte County Board of Supervisors. The Berry Creek Rancheria of Tyme Maidu Indians of California is headquartered in Oroville. The Berry Creek Rancheria operates Gold Country Casino. The Mooretown Rancheria of Maidu Indians of California is also headquartered in Oroville. The Mooretown Rancheria operates Feather Falls Casino. The governmental headquarters of the Mechoopda Indian Tribe of Chico Rancheria is located in Chico. Butte County is split between the 1st and 3rd Assembly districts, represented by Republican Brian Dahle and Republican James Gallagher, respectively. The county is in the 4th Senate District, represented by Republican Jim Nielsen. Butte County is in California's 1st congressional district, represented by Republican Doug LaMalfa. Butte is a Republican-leaning county in Presidential and congressional elections. Lyndon Johnson in 1964 is the last Democrat to win a majority in the county (It was also his weakest county victory in the state that year); however, Bill Clinton and Barack Obama won the county by plurality in 1992 and 2008, respectively. The library operates as a department of the County of Butte, governed by the Butte County Board of Supervisors. Bidwell's Bar - now located under Lake Oroville. Hamilton - Butte County's first permanent county seat. John Bidwell discovered gold at Hamilton in 1848, and the settlement arose. It was located on the west side of the Feather River, 15 mi (24 km) downstream from Oroville. The population ranking of the following table is based on the 2010 census of Butte County. Several movies have been filmed in Butte County, including Gone with the Wind, The Outlaw Josey Wales, Friendly Persuasion, Magic Town, The Klansman, Ruby Ridge: An American Tragedy, The Adventures of Robin Hood and Under Wraps. The most recent season of the television series Sons of Anarchy features an episode in which the Sons come into contact with corrupt police in the fictional town of Eden, located in Butte County. ^ Statistical Report of the California State Board of Agriculture for the Year 1918. Sacramento, CA: California State Printing Office. 1919. p. 316. Retrieved May 14, 2012. ^ "Butte County High Point". Peakbagger.com. Archived from the original on May 2, 2015. Retrieved February 11, 2015. ^ "Annual Estimates of the Resident Population: April 1, 2010 to July 1, 2016 Estimates". Archived from the original on January 29, 2017. Retrieved April 27, 2017. ^ "Population and Housing Unit Estimates". U.S. Census Bureau. August 15, 2017. Archived from the original on August 6, 2017. Retrieved August 15, 2017. ^ a b c "State & County QuickFacts". United States Census Bureau. Archived from the original on July 7, 2011. Retrieved April 3, 2016. ^ "Death toll jumps to 23 as 'challenging' Camp Fire pushes toward Lake Oroville". The Sacramento Bee. November 10, 2018. Archived from the original on November 10, 2018. ^ "California wildfires: Death toll rises to 25". BBC. November 11, 2018. Retrieved November 18, 2018. ^ Gina Martinez (November 14, 2018). "The California Fire That Killed 48 People Is the Deadliest U.S. Wildfire in a Century". Time. Retrieved November 18, 2018. ^ a b c d e f g h i j k l m n o p q U.S. Census Bureau. American Community Survey, 2011 American Community Survey 5-Year Estimates, Table B02001. American FactFinder Archived September 11, 2013, at the Wayback Machine. Retrieved October 26, 2013. ^ a b U.S. Census Bureau. American Community Survey, 2011 American Community Survey 5-Year Estimates, Table B03003. American FactFinder Archived September 11, 2013, at the Wayback Machine. Retrieved October 26, 2013. ^ a b U.S. Census Bureau. American Community Survey, 2011 American Community Survey 5-Year Estimates, Table B19301. American FactFinder Archived September 11, 2013, at the Wayback Machine. Retrieved October 21, 2013. ^ a b U.S. Census Bureau. American Community Survey, 2011 American Community Survey 5-Year Estimates, Table B19013. American FactFinder Archived September 11, 2013, at the Wayback Machine. Retrieved October 21, 2013. ^ a b U.S. Census Bureau. American Community Survey, 2011 American Community Survey 5-Year Estimates, Table B19113. American FactFinder Archived September 11, 2013, at the Wayback Machine. Retrieved October 21, 2013. ^ a b U.S. Census Bureau. American Community Survey, 2011 American Community Survey 5-Year Estimates. American FactFinder Archived September 11, 2013, at the Wayback Machine. Retrieved October 21, 2013. ^ U.S. Census Bureau. American Community Survey, 2011 American Community Survey 5-Year Estimates, Table B01003. American FactFinder Archived September 11, 2013, at the Wayback Machine. Retrieved October 21, 2013. ^ "Historical Census Browser". University of Virginia Library. Archived from the original on August 16, 2012. Retrieved September 24, 2015. ^ Forstall, Richard L., ed. (March 27, 1995). "Population of Counties by Decennial Census: 1900 to 1990". United States Census Bureau. Archived from the original on September 24, 2015. Retrieved September 24, 2015. ^ "Census 2000 PHC-T-4. Ranking Tables for Counties: 1990 and 2000" (PDF). United States Census Bureau. April 2, 2001. Archived (PDF) from the original on December 18, 2014. Retrieved September 24, 2015. ^ a b c United States Department of Justice, Federal Bureau of Investigation. Crime in the United States, 2012, Table 8 (California) Archived June 28, 2016, at the Wayback Machine. Retrieved November 14, 2013. ^ a b c d e f g h i j k l m n o p q California Secretary of State. February 10, 2013 - Report of Registration Archived November 3, 2013, at the Wayback Machine. Retrieved October 31, 2013. ^ "Members Assembly". State of California. Archived from the original on April 24, 2013. Retrieved March 19, 2013. ^ Colby, Robert; McDonald, Lois (2005). Magalia to Stirling City. Arcadia. p. 66. ^ Staff, Website Services & Coordination. "US Census Bureau 2010 Census Interactive Population Map". www.census.gov. Archived from the original on April 30, 2018. Retrieved April 30, 2018. 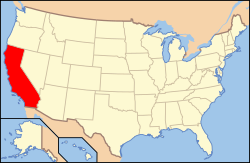 Wikimedia Commons has media related to Butte County, California.